Kia ora and haere mai, welcome to the 35th instalment of 9mm for 2018, and the 207th overall edition of our long-running author interview series. Today I'm very pleased to welcome 'British-Australian' thriller writer LA (Louisa) Larkin to Crime Watch. She is the author of several action-packed thrillers which take readers to fascinating locales. Her storytelling has been likened to Michael Crichton by The Guardian and Alistair MacLean by The Times. I grew up loving the tales of Alistair MacLean (my father recommended him to me as an adolescent), that wonderful combination of exciting, page-turning tales that took me as a reader into fascinating new-to-me worlds. Louisa is herself an adventurer at heart, and brings those sensibilities to her thriller writing. In the video below she talks about the inspiration for DEVOUR. Born in England, Louisa studied literature at the University of London’s Royal Holloway College. Now living in Australia, she's worked in a variety of corporate careers, including for one of Australia's leading climate change consultancies. 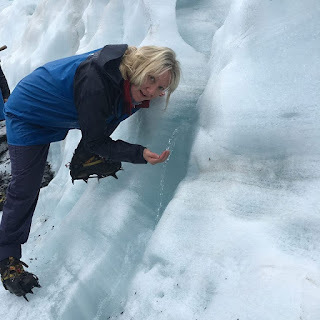 Her passion for the environment comes through in the thrillers, which are globally minded and weave in 'big issues' among the page-turning threats. 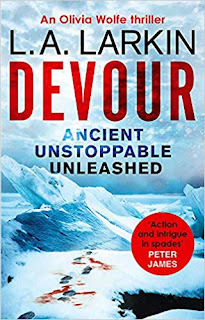 Louisa spent time in Antarctica as research for her two thrillers set there, THIRST and DEVOUR. The latter introduces journalist Oliva Wolfe, and was inspired by a real-life British Antarctic expedition that planned to drill 3km into the ice in search of ancient life that had never had any human contact. Louisa also writes humorous animal mysteries under the name Louisa Bennett. But for now, LA Larkin becomes the latest author to stare down the barrel of 9mm. I don’t have a favourite and I have a very wide taste in reading. I’ve loved James Rollins’ Sigma Force series, not just because I love adventure stories but because Commander Gray Pierce develops across the series. At the other end of the reading spectrum I have really enjoyed Ben Aaronovitch’s Peter Grant series set in and around London about a Met police officer who becomes the only apprenticed wizard in England and has to solve spiritual crime. I’m big on strong female central characters as crime fiction heroes, so of course I adore the trailblazing Jane Tennison, and more recently, Meg Gardiner’s Caitlin Hendrix character. Famous Five and Secret Seven = adventure. I’ve written little stories and poems since I was a child, but always kept them to myself. I once adapted Joseph Conrad’s lesser known novel, Arrow of Gold, into a play. My first manuscript was my first published novel, The Genesis Flaw. Swimming, Pilates, Spin, Zumba, walking the dogs and traveling to remote locations like Antarctica or volunteering at a South African wildlife reserve. When I’m exhausted with all that, I read novels. I live in Sydney, Australia, which is an amazing place. But I think visitors should get out of Sydney and take a beach house in Jervis Bay, or enjoy the wine tasting in the Hunter Valley, or trek through the Blue Mountains. Sarah Michelle Gellar in Buffy The Vampire Slayer. I always did like a challenge! The new one I’m working on, which I can’t tell you about. I can tell you why. Because it’s the most challenging book I’ve ever written and it touches my heart every time I sit down to write it. First question: Squeal, followed by a glass of wine. Second question: Squeal, followed by a glass of wine. I was on a panel at a writers’ festival and in the green room, waiting for our panel discussion to start. I went to join my fellow panellists. One of them looked around and said he wondered when L.A. Larkin would turn up. I said I was already here. He looked shocked, then proceeded to tell me that if he’d known I was female he wouldn’t have read my action thriller. Apparently, women just can’t write this kind of thriller! I couldn’t believe it. Thank you Louisa, we appreciate you chatting to Crime Watch. You can read more about LA Larkin and her books at her website, and follow her on Twitter.